Major and minor five‐finger patterns are taught in Level 2A of Piano Adventures®—after the basics of reading are acquired in the Primer and Level 1. With the fundamentals of note recognition and intervallic reading firmly in place, this multi‐key approach can take hold without liability. After students learn the basics of reading, we can use five‐finger positions to enhance reading skill by eliciting visual, kinesthetic, and aural pattern recognition. A student who reads only note‐by‐note misses the musical picture. Why? Because music is coded in contour and context. Contour of musical line depicts phrasing and the expressiveness of changing pitch. Contour is decoded through recognition of pitch direction and interval. Context suggests another level of pattern recognition. Context provides harmonic meaning through recognition of chords, key, tonic/dominant relationships, and so on. Context provides artistic meaning through recognition of form and motivic relationships, as well as more subtle relationships found through conscientious study of the score. From the standpoint of artistry, understanding of contour and context can reduce a dense score to relative simplicity, and thus provide musical meaning that leads to expressive playing. From the standpoint of reading skill, an ability to grasp contour and context simplifies the reading process by allowing visual information to be processed in “chunks” through recognition of familiar patterns. The Primer introduces intervallic reading and Level 1 reinforces it. Level 1 introduces five‐finger tonality in C and G, with emphasis on tonic and dominant scale steps. Level 2A addresses multi‐key playing with transpositions to D, A, and to minor five‐finger patterns. Level 2B adds meaning to triad recognition with awareness of key, key signature, the full major scale, and recognition of primary chord functions—I, IV, and V7. Level 3A reinforces and expands recognition of chord names and chord function. Level 3B introduces chord inversions and minor tonalities. Level 4 reinforces these minor key patterns with special focus on the V7 in root position, and reviews chord inversion recognition. Level 5 introduces new flat‐key patterns and recognition of I, IV, and V chords in any inversion and any key. Decoding contour requires recognition of direction (up, down, same) and interval span (step, skip, fourth, fifth, and so on). This reading skill is not a substitute for note recognition, but a skill to be learned concurrent with note naming. For this reason, the Primer level merges note‐name recognition with intervallic/directional reading. These skills go hand‐in‐hand. Note‐name recognition is essential for student confidence. Yet, directional/intervallic reading is not of secondary importance. It is essential for grasping musical contour and for fluent sightreading. Intervallic reading is pattern recognition in its most elemental form, and rests on a foundation of note recognition. Major and minor five‐finger patterns (pentascales) reinforce recognition of major and minor triads. Major and minor five‐finger patterns prepare the student for major and minor scales. Major and minor five‐finger patterns highlight the tonic and dominant notes. 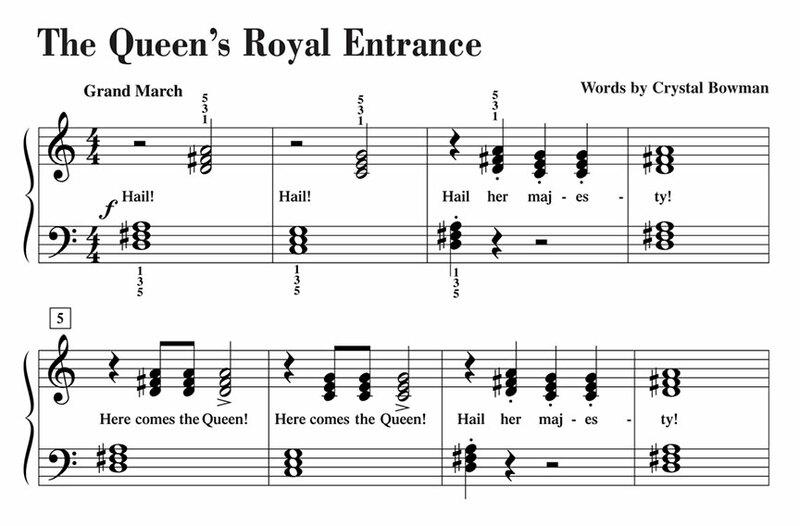 Because five‐finger patterns lie stepwise under the hand, this context is ideal for reinforcement of intervallic reading and for transposition. 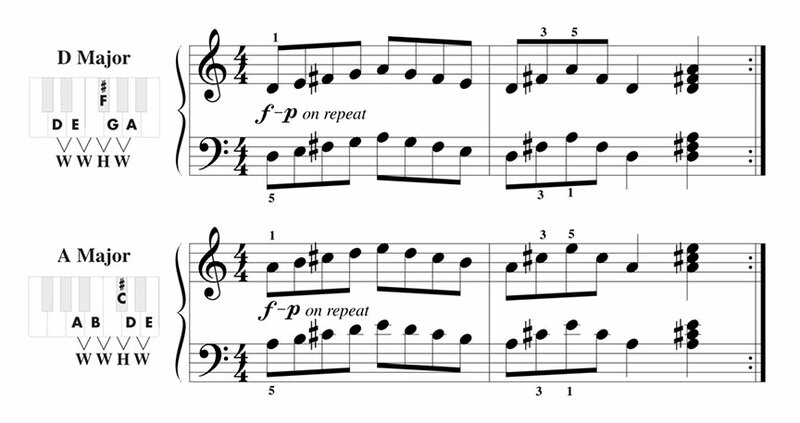 Many pieces at Levels 1 and 2A require moving the hand between familiar positions. This movement between positions sharpens the student’s reading, mitigates position dependence, and invites motion that can prevent a locked wrist. Since music making involves these modalities in combination, the pedagogical use of five‐finger scales provides a playing field for exploring the integration of elementary patterns—visual, kinesthetic, and auditory. Occasionally, it’s helpful to spotlight a specific modality. For instance, the shift from major to minor (or vice versa) is aurally striking. We introduce five‐finger patterns in terms of black and white, which is visual. We also stress the feel of the pattern. The pairing of D and A Major highlights both their visual and kinesthetic similarities. Eighth notes are not presented in Piano Adventures® until Level 2A. This allows the student to be at ease with rhythm at the Primer and Level 1. The beat can be quite fast, unhampered by intruding eighth notes. This promotes a rhythmic fluency based on meter, instead of a slow, interrupted beat. Teachers readily recognize the increase in musicality. By not yet subdividing the beat, these early levels present a limited set of rhythmic values which the student can readily “chunk” into macro patterns, such as 1 1 1–2 or 1–2 1–2. When eighth notes are introduced at the beginning of Level 2A, they are presented in rhythmic groupings. Thus the student is led to read eighth notes, not as individual counts or sub‐counts, but in the context of a meaningful rhythmic pattern that is felt kinesthetically, not just intellectually. Repetition of predictable patterns leads to recognition of these patterns. We can’t assume that random occurrence of principal patterns will lead to recognition. We need to equip students with tools of pattern recognition through systematic presentation of patterns and a matching repertoire. Through transposition, “question and answer,” harmonization, ear training, and a carefully conceived repertoire, five‐finger patterns lay a foundation of pattern recognition that ultimately leads to a keen sense of tonality and intelligent, fluent music reading.